A few weeks ago, one of the young women who attended a series of my workshops told me, “You always think that everybody is an artist.” This young woman had decided to be a lawyer and was wondering if it was my love for art that made me assume that everybody was an artist. And so…here I am…thinking…do I believe that everyone has a form of art they can deeply relate to? Do I trust that everyone has a form of art that can really uplift their being? Do I think everyone can truly enjoy expressing the essence of who they are through art? Do I truly know that we can enjoy something without necessarily being good at it? Without any hesitation I say yes to all of these questions. You did not come on earth with only a logical mind. You did not come on earth to make every single decision through your analytical mind. You did not come on earth to be successful. You came on earth to be joyful. The first one does not necessary lead to the second one. You are a human being with five senses, a right and a left-brain, emotions, a heart, and a physical and spiritual identity. If you only rely on your logical mind you are designing a life style that guarantees unhappiness. 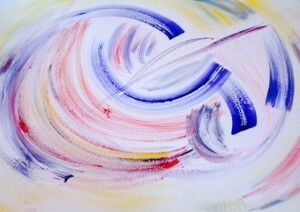 Discovering a form of art expression that uplifts you automatically opens you up to the spiritual part of who you are. Through that form of art, you may be expressing deep emotions or sensations that you may not be able to express any other way. In brief, you are expanding your horizon of experience and shifting paradigm. Each time you expand your horizon of experience from a place of joy, you connect to the biggest part of who you are; your spiritual being. Each time you connect to your spiritual being you are more guided in your decision making process, you are more at peace, your heart is more opened and you have more energy. I love to cook but I never ever follow a recipe though I will get inspired from one. I also love to do abstract painting with acrylic on a big sheet. I recently discovered clay and I always have fun with my guitar. Each of you has an art form they can deeply connect to. Whether it is with food, gardening, movements, sounds, visual art, etc. Your first step is to explore what form of art brings you joy. Embrace your self-judgment if you have any and keep on going. Your commitment to an art form will help you grow faster than what you think and be centered in your heart. So get going and let me know how you are doing! Do you want to know what form of art makes your essence blossom? Take a complimentary session with Tejpal.